Andrew from Next Level Web has been hunting for the best WordPress audio plugin. He has kindly provided this article comparing the best four, with advice on how to choose the best audio plugin for your own website. Are you looking to add a bit of pizzazz to your website? Do you feel your website needs something to keep visitors a bit more entertained but not sure what? 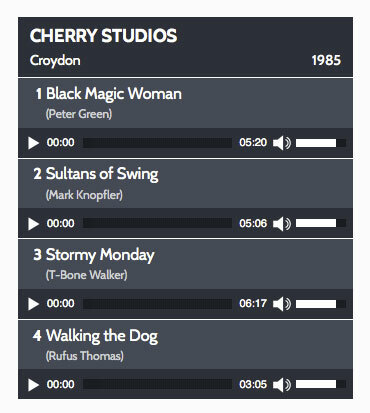 Well, we have an idea for you, how about adding a WordPress audio plugin that allows you to play music on your website? If you have a WordPress website then you are probably aware that it offers numerous plugins for different functionalities. You can easily embed an audio file to your website with a WordPress audio player plugin, allowing users to listen to music as they browse your website. Now, when it comes to plugins, there are a variety of different plugins that offer you the functionality you need. The case for WordPress audio plugin is no different, so how do you know which one to opt for? We have tested the most popular WordPress audio player plugins and selected the top four. During our testing, we made sure they were easy to use for site visitors, provided you with customization options, and were easy to setup. Whether you are a band or would like to just add music to your website, you want a WordPress audio player plugin that gives you freedom and allows you to easily embed audio. Post Table Pro does that and more. It is both easy to set up for you, and user-friendly for your visitor. This will enhance their overall experience on your website. 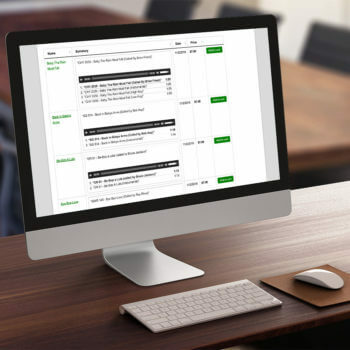 This audio plugin works by creating a searchable, filterable table of your audio tracks. Each one appears on its own row in the table, with embedded audio player plus any other information that you want to include. For example, you might want to display data such as song title, album, category, tags, file size, length, artist, etc. You can either use Posts Table Pro on its own with the built-in WordPress audio embeds. Alternatively, you can use it with other WordPress audio player plugins to display more flashy audio players within the table layout. At your end, you can either use standard WordPress posts for your audio, or create a custom post type for this purpose. Create a post for each audio track that you want to display using the WordPress audio plugin, along with any extra data you wish to display. You can then easily embed audio files using the standard WordPress functions. The “Add Media” button allows you to upload audio to your audio library. You can easily remove and add songs in your media library. If you want to add playlists, you have the option of creating playlists for your users to listen to. Once you’ve done that, Post Table Pro gives you a ton of options to display the music on your website with little to no effort. At your user’s end, Posts Table Pro creates a table containing music players and other information about each track. The user can select songs or playlists to listen to. Read the Tutorial: Use Posts Table Pro to Create a WordPress Audio Library. Post Table Pro is definitely one of the more user-friendly WordPress audio plugins. It is a popular audio plugin for not only musicians and composers, but also those looking to sell any time of audio online. You can use it with e-commerce plugins such as Easy Digital Downloads (EDD tutorial here). There’s even a WooCommerce version of Posts Table Pro called WooCommerce Product Table, which is perfect for creating a WooCommerce audio store. Create an audio gallery on your WordPress site today! If you are looking for a simple WordPress audio player, with no need for additional functionalities, then Audio Album is a good choice. The player won’t “wow” you in terms of design or anything. However, it is so simple that it easily fits into any website. You can add songs and albums and have different ones on each page if you like this plugin. Audio Album lets you add the title along with song information to display as the song plays. It supports numerous audio file types from mp3 to wav. You can also links to the audio files to display lyrics or any other information in a popup window. You need to create these popups and can customize the width and height. This means that it doesn’t take away much from your website. The player itself is easy to use at the user’s end. It displays all the songs available for them to listen to and they can easily go through them. You do have the option of changing the color of the player so it easily goes with the theme of your website. When adding music to your website, you also want to make sure you add a bit of color and design. The HTML5 jQuery Audio Player plugin allows you to do just that. If you have a funky theme and want a music player with a similar style then this plugin player is it. The trendy player allows you to host playlists, albums, and audio tracks. It also provides you with a little bit of customizability. For example, you have an option of adding album art and display ratings while also allowing users to rate the audio file. The player, however, only supports mp3 and ogg audio files. If you have other formats then you will have to convert them. The HTML5 jQuery Audio Player also provides the option to sell audio online. Whether you have an audiobook or want to sell music, you can. The player will display a “buy” option in the player next to the title of the song. This lets users easily buy and download the file. HTML5 jQuery Audio Player has a free lite version and a pro version which you have to buy. The pro version allows for multiple playlists, buy and download. It also has reordering of tracks at the user end, and a few other options that the lite version lacks. This WordPress audio plugin works nicely with the Posts Table Pro plugin listed above. By using them together, you can show more audio files in the table, each with an embedded compact audio player. This is another basic audio player that you can have on your website. It won’t attract visitors in terms of design as it has a basic layout, but allows you to host audio files on your website with ease. It is easy to manage and a great option for those that want to host podcasts which they update on a regular basis. It doesn’t really have much of a playlist option. This means it isn’t the best option if you want to have albums or a wide variety of media. However, if you like this plugin then you can use Posts Table Pro to list multiple tracks, each with their own compact audio player button. Picking the right WordPress audio plugin isn’t rocket science. You just need to make sure that the plugin is easy to use and will get the most from the audio you display. Any of the four WordPress audio player plugins we’ve suggested will do just that. I got to know about this need thing. I am using WordPress for many days but didn't know about this feature. This audio feature will be helping me a lot now. I will use this plugin to listen to music while writing a blog. 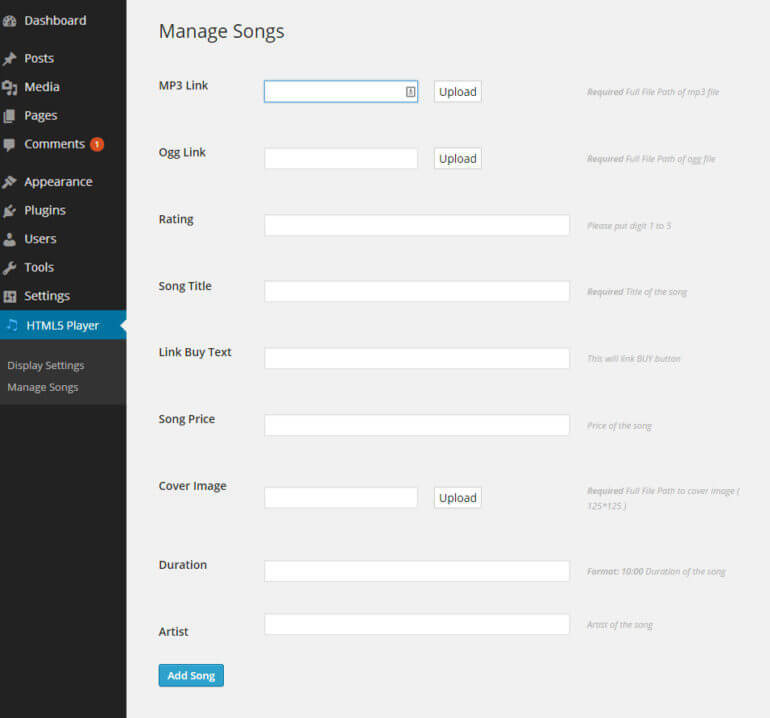 You can manage the link of the songs from the Wp-admin panel.